You may enter 2 phone numbers if you do not want a name on it. The webbing on this collar is a 1" wide and has highly reflective stripes woven in to it. Sewn on an industrial sewing machine with your dog's safety in mind. 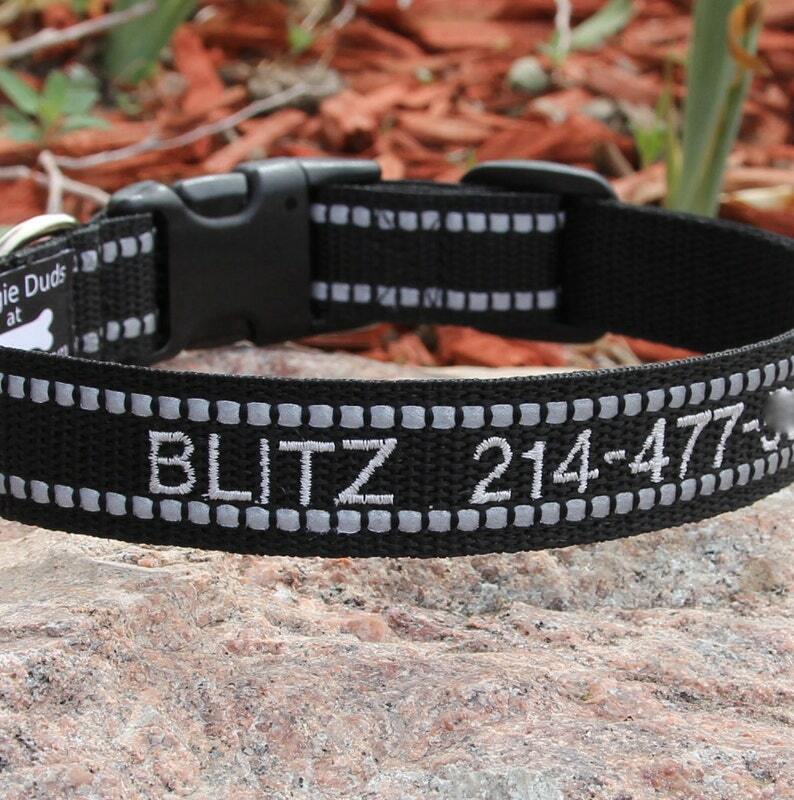 The collar will be custom embroidered with your dog's name and your phone number. COLOR IS BLACK WITH REFLECTIVE STRIPES. Please measure your dog's neck to determine what size s/he needs. If you are measuring your dog's current collar, please include the buckles. If you just send the webbing length as the size, the collar will be too small. No requests for collars under 14" please. In "note to seller" please write exactly what you would like on the collar. If you would like your dog's name written in all capital letters then please do so in the message box. Not including this info will delay production time. Matching 4', 5', and 6' reflective leashes are available in the drop down window of this listing. *****Beyond thrilled with my purchase. The quality is fantastic for our outdoor dog. The shipping in quick too. HIGHLY recommended!! *****Super reflective and easy to read collar!!! Super fast delivery!!! *****WOW! Love this collar & super fast shipping!! Many Thanks! Fantastic product and customer service as always! This collar is gorgeous and practical.